Thanksgiving is certainly a time to be thankful. Sometimes I’m sad that we recognize gratitude on just one day a year in this country. Now much of that day has been overshadowed by Black Friday deals. 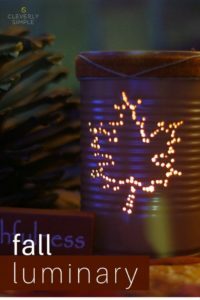 Since I don’t see that changing anytime soon, I decided to bring the reminder of Thanksgiving into our home before the holiday. If Christmas trees can be displayed weeks before Christmas, why not have a Thanksgiving tree before Thanksgiving? 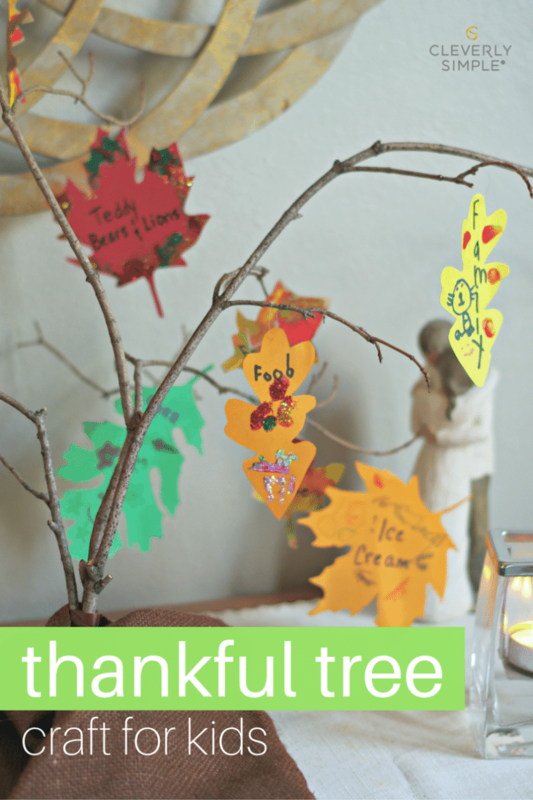 Making your own homemade thankful tree is very simple. Today I’ll show you how to transform twigs into a little stand up tree. Each family member declares some things they are thankful for and writes them down on paper leaves. The leaves are then decorated and hung on the branches, reminding us of our gratitude – the very purpose of Thanksgiving. 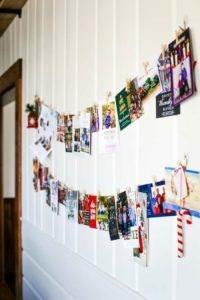 No door busters needed here, friends 🙂 It’s inexpensive, fun and a thoughtful. 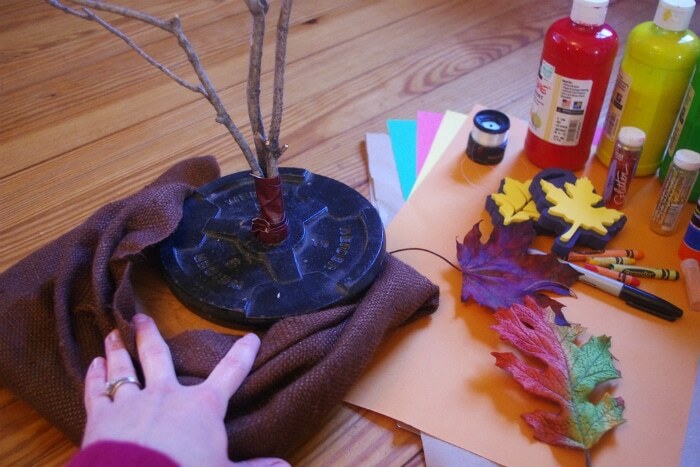 Are you ready to make a homemade Thanksgiving tree with me? To start, you’ll need some bare twigs (check out parks, trails or your own backyard), some duct tape, one barbell weight, burlap fabric and a piece of wooden block if you have it. 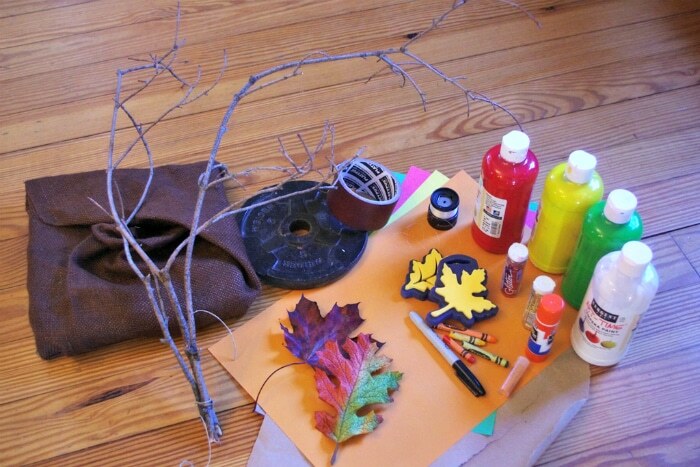 These supplies will all create your tree. 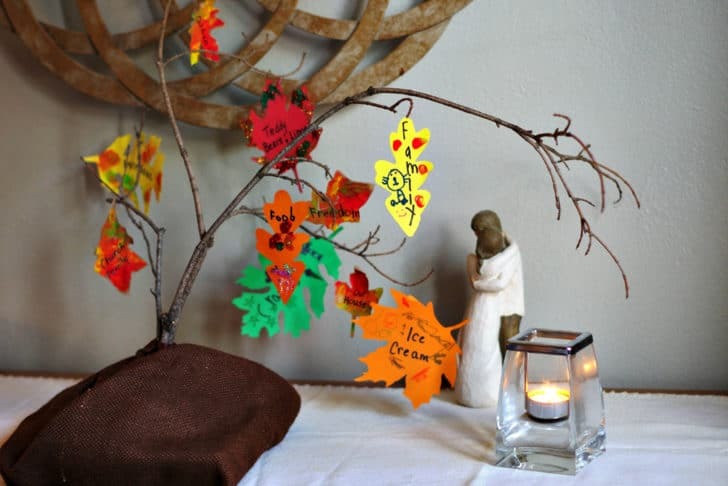 The rest is for decoration… colored paper, scissors and things to glam up your leaves. I pulled out markers, tempura paints, glitter and some leaf shapes to give inspiration. To hang your leaves, you’ll need string or fishing line. The purpose of the barbell weight is to provide stability for our tree. You could pull together some real heavy twigs and those babies will be standing tall. Simple wrap the bottom of the twigs with duct tape (brown colored tape works great here) to hold them together. Next, using folded pieces of the same duct tape, wrap them around the bottom until the end fits tightly into the center hole of the weight. 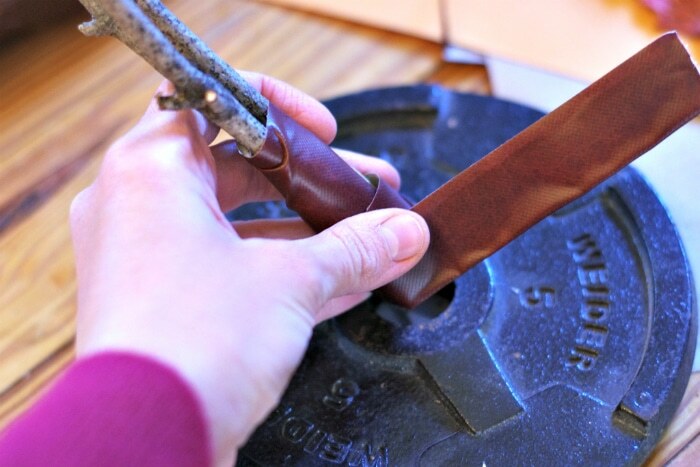 Since a barbell weight doesn’t belong in nature, you’ll want to cover it up with some burlap or fabric. If you set the weight on a wooden block first, it will give nice height and simulate the look of a potted tree. Now on to the leaves! If you have access to pre-cut paper leaves, go for it. 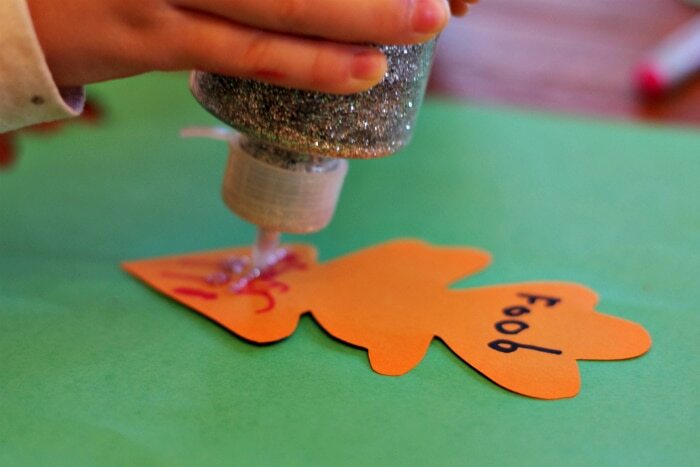 Otherwise, you can create paper leaves in a variety of ways. I traced around a leaf cookie cutter, a fake leaf from an old wreath, a real leaf from our side yard and I stamped a leaf shape using tempura paint. 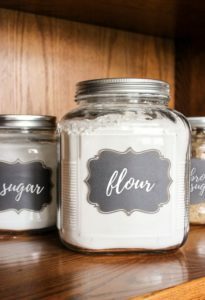 To get the marble effect, swirl several colors together on the stamp before setting it down. 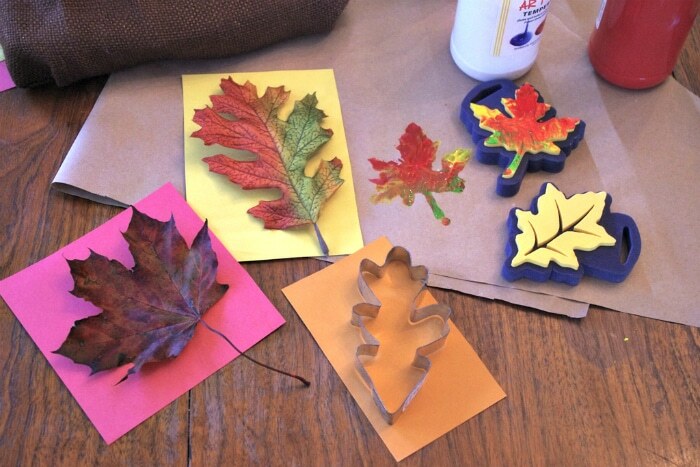 Cut out your leaf designs and prepare your heart for thanksgivings! 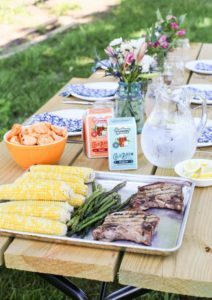 This is a great family activity. Share with one another what you are thankful for. 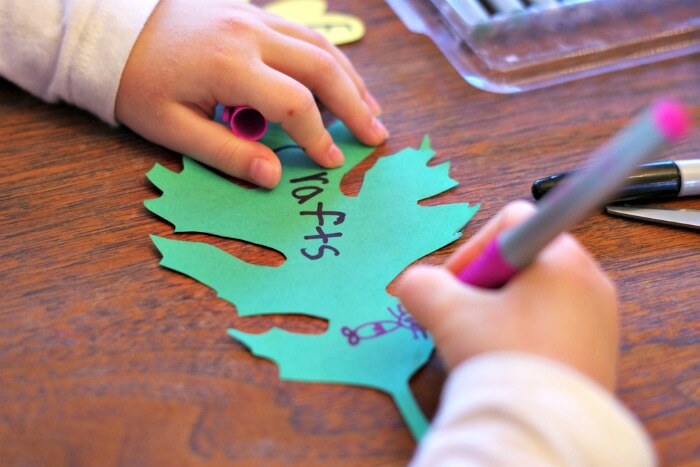 Using a marker, write down 1-2 things on each leaf. There are no wrong answers. My 5 year old said family, crafts and food. My 3 year old said teddy bears & lions, ice cream and windows… yes, windows! 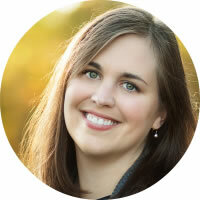 My husband and I added freedom, church family, our home and children. My 1 year old was trying to eat the glitter 🙂 Of course, there is so much more we could have written down. This tree should really be as big as our living room… as big as our house! Decorate the leaves with whatever you think is pretty. 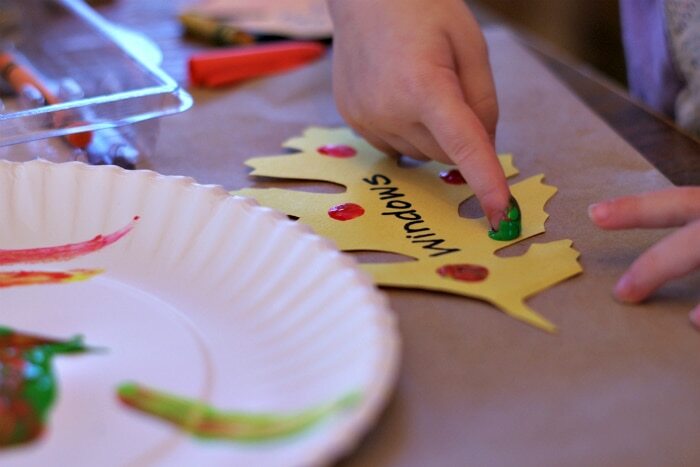 Let them dry and attach some string or fishing line to one point on each leaf. I used a needle to poke a small hole for the string. Our Thanksgiving tree sits by our entryway as a reminder of our gratitude for so many things in life. It will be our new family tradition every November. We love it so much that we are going to keep it up through Christmas. Who says you can’t string a few twinkling lights on it as well? After the holidays, we’ll store our tree and ready it for new leaves next year. 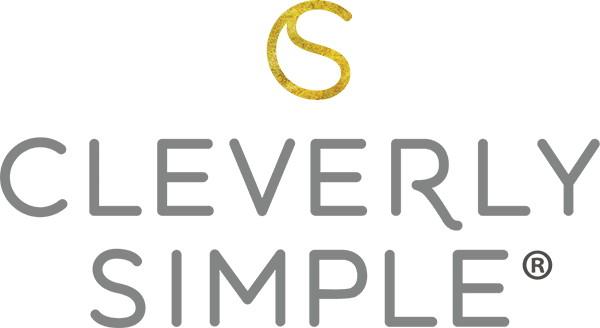 Happy Thanksgiving friends…and THANKS for reading!